I’ve written about my old friend before—the tea party worshiping, neo-conservative loving, born-again Christian who won’t give up. He keeps sending me e-mails that supports his freaky, far-out thinking. Today he sent me two e-mails that I remember. I’ve pretty much forgotten the others—what I think of as mostly humorous filler. I’m starting with the e-mail that alleged: “Rosie O’Donnell gets ISIS tattoo for ‘freedom fighters’.” This one came from a site that calls itself The People’s Cube. According to Wiki, The People’s Cube is a U.S. based satirical conservative website that was launched April 1, 2005, as a sequel to Communists for Kerry. Since this e-mail came from my old, long-time friend, the Far-Right Cement Wall, I immediately went to Snopes and then Urban Legends. There was nothing on the Urban Legends website, but I hit pay dirt with Snopes. Are far right extremist conservatives really that gullible and stupid? Don’t answer that question, because I don’t think most extremists—left or right—bother to fact check anything. Here’s one sentence from the other e-mail from my friend, the Far-Right Concrete Wall—I’d share the entire e-mail, but I think it is too long and pretty much repeats the same crap. My response: More crap thinking for fools who are easy to fool. Do you actually believe this crap? I hope not. Studies show that 49% of all SNAP (food stamps) participants are children (age 18 or younger), with almost two-thirds (66%) of SNAP children living in single-parent households. In total, 76% of SNAP benefits go towards households with children, 16% go to households with disabled person, and 9% go to households with senior citizens. Stigma associated with the SNAP program has led to several common misconceptions about how the program works and who receives the benefits. For instance, many Americans believe that the majority of SNAP benefits go towards people who could be working. In fact, more than half of SNAP recipients are children or the elderly. For the remaining working-age individuals, many of them are currently employed (THEY ARE CALLED THE WORKING POOR WHO WORK FOR POVERTY WAGES FOR COMPANIES LIKE Walmart or the fast food industry). At least forty percent of all SNAP beneficiaries live in a household with earnings. In fact, the majority of SNAP households do not receive cash welfare benefits (around 10% receive cash welfare), with increasing numbers of SNAP beneficiaries obtaining their primary source of income from employment. Food stamps (SNAP) is just one welfare program. Another welfare program is Housing Choice Vouchers. The fact sheet for this program says, “The housing choice voucher program is the federal government’s major program for assisting very low-income families, the elderly, and the disabled to afford decent, safe, and sanitary housing in the private market. Since housing assistance is provided on behalf of the family or individual, participants are able to find their own housing, including single-family homes, townhouses and apartments. “A large Majority of Housing Voucher Recipients Work, are Elderly, or Have Disabilities. Elderly or disabled households make up nearly half (49 percent) of all voucher households, a significant increase over the past decade. This increase, which stemmed largely from a jump in the number of voucher households headed by a non-elderly person with disabilities, may have been driven substantially by restrictions on the types of households that can receive newly authorized vouchers. In fact, my wife rented an apartment she once owned to a woman and her daughter who were eligible for this voucher. The woman worked two jobs—one full time at Costco that started at $11.50 an hour (the average pay at Costco is $21 an hour) and is considered one of the highest starting wages for this industry—but several years ago Wall Street criticized Costco for paying their employees too much, because, if Costco paid poverty wages like Walmart, then the Costco’s stock might have been higher due to higher profits so the already wealthy shareholders could increase their wealth even higher (I read the Op-Ed piece that criticized Costco). This woman, the renter, also worked a part time job, but still earned—with two jobs—poverty wages. She couldn’t afford a car, so she walked to the nearest bus stop and took buses to work for both jobs. I then challenged my old friend, the Far-Right Cement Wall, to PLEASE POINT OUT the U.S. Welfare Programs that pay able bodied adults not to work, and prove it. He hasn’t replied yet. He seldom does. What he does is wait for me to call him a fool, and then he accuses me of calling him names, because—according to him—this is what Liberals do when they are wrong and have nothing better to say. Maybe he should ask The People’s Cube for help to manufacture some fake satirical evidence that other fools like him will believe without thinking. 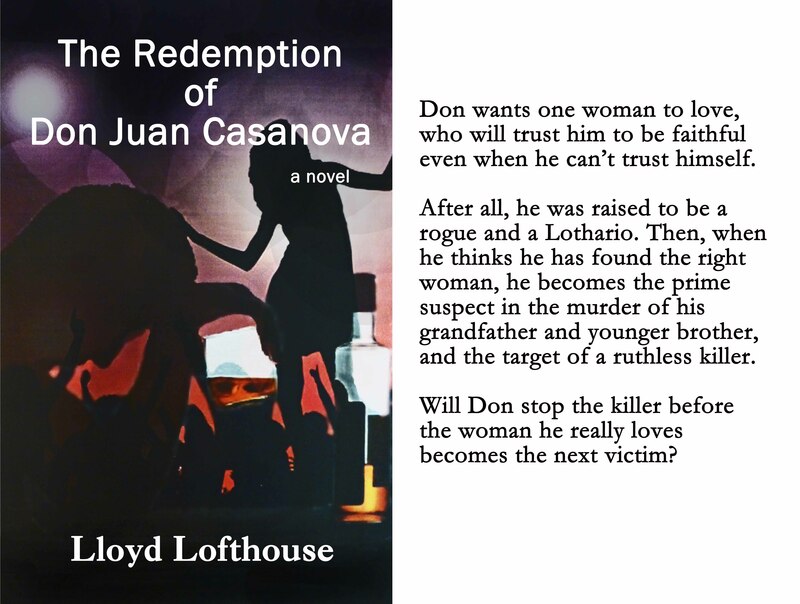 His fourth novel is The Redemption of Don Juan Casanova. Lloyd Lofthouse also worked as a maître d’ in a nightclub called the Red Onion for a few years. A romantic at heart, in his award winning novels, he tests true love in difficult situations and the challenges of keeping that love alive. My Splendid Concubine, his first novel, is an epic love story that teaches acceptance and respect for other people and their cultures. Running with the Enemy, his second novel is a love story that will either cost the characters their lives or will complete each other’s hearts. Lloyd Lofthouse lives with his family in California’s San Francisco Bay area. ← Is your creative mind suffering from social media overload like mine is? It’s tricky to have an old friend who’s a part of the Far-Right Concrete Wall. I really cannot fathom how people have so little empathy for those who try but just can’t get there. I chalk it up to low or no EQ, but still, it seems so hard-hearted and frankly, selfish. Just damn selfish. They are narcissists and/or sociopaths and/or psychopaths. I think people like this are the ones who have caused most of the wars, destruction and suffering in the world. For instance, Hitler was a neurotic psychopath bordering on schizophrenia. There is even a gene—and a brain profile—that has been linked to psychopaths. Smithsonian.com also reported on The Neuroscientist Who Discovered He Was a Psychopath. I think most of these far-right concrete wall people would also fit the psychopath’s brain scan profile and have a variant of the MAO-A gene. I think this causes these people to lose the ability to reason logically. Their aggressive behavior rules their thinking. So this begs the question . . . how can one stay friends with the far-right concrete wall types, as you seem to do with your old friend? In my case, I practice, “Take what you like, and leave the rest.” Except when they badger me with relentless provocative emails. How do I stay friends with a far-right concrete wall type? He lives five hundred miles away (I haven’t seen him face to face for years), and I don’t read all of his badgering e-mails. A few days ago, I had my fill of his badgering so I told him to stop with all the political and religious crap, because I wasn’t going to read it anyway. I did say it was okay to send me humor that wasn’t political or religious. After several days of silence, he sent something today that avoided both. The irony is that the SNAP recipient is merely a pass-through, as with all such ‘entitlement’ benefits, it’s guaranteed income for WM. If they paid a living wage instead, workers would have more discretion in spending. They might actually support Main Street instead of Wall Street. There is another much worse tragedy brewing. Wall Street’s demands for increased profits each quarter causes corporations to make short term decisions and to often ignore the long term outcomes of those short term decisions. One effect of that is the trend toward automation in almost every business sector. From what I’ve read and heard about job losses due to automation, I think it is arguable that Wall Street and corporations are cutting their own throats because those lost jobs to automation also means less money in the pockets of consumers. What’s the private sector going to do when too many people don’t have money to spend because the only jobs they can find are ones with poverty wages—service jobs, unless automation gets rid of janitors, gardeners and cashiers too (and corporations are already working on getting rid of cashiers with automated check out. For instance Home Depot where they have several auto check outs with only one cashier watching over them. Eventually, what are the billionaire oligarchs going to do with all the excess people who can’t find jobs to qualify for food stamps and housing vouchers and who also doesn’t have enough money to be consumers who can afford to buy all the junk that the corporations manufacture and sell to make their annual profits? What’s Apple going to do with all those unsold iPhones when there’s no one with money to line up outside of their stores each time a new model comes out? And the few people who still have jobs and most of the money—what are they going to do to protect themsevles from the majority who can’t find work with a livable wage—build walls around their homes with armed drones patrolling the perimeter? But wait, I think the billionaires are already doing that—building the walls with private armies to protect them. We could have guaranteed income, with restrictions on where and how one could spend electronic money…bread, and circuses. Most seem to think that whatever world the Free Market creates, however unpalatable, will be far better than anything Government crafts. So if we have armies of starving unemployed banging at the gates of the billionaires’ walled compounds, hey, it’s still the best of all possible worlds. And: IWatches! I don’t remember any time in history when we had a free market without government. I’d love to see a few million people who are starving go over the walls of the billionaire compounds like in that Zombie movie. They can eat the billionaires. Most of them should be very tender but probably bitter to the taste.